In 1964, a 22-year-old Aretha Franklin declared in a song called “One Room Paradise” that she didn’t need to live in a castle or be showered with diamonds and pearls in order to be happy. A little one-room apartment would be totally fine as long as she could be with the man she loved. Today’s tribute is dedicated to the Queen of Soul, who passed away yesterday in Detroit at the age of 76. Written by John Leslie McFarland, “One Room Paradise” first appeared as the final track of Runnin’ Out Of Fools, her seventh studio album. While the song’s character aspires to own something precious, Franklin — the star — loved her jewelry. She has been photographed throughout her career wearing long strands of cultured pearls, gemstone earrings and diamond rings. 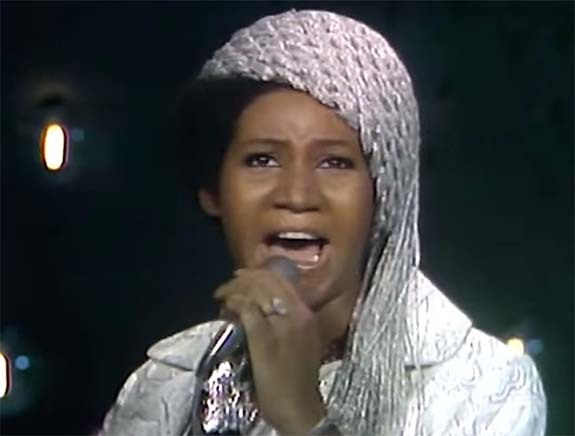 The first woman to be inducted into the Rock & Roll Hall of Fame (1987), Franklin has earned 19 Grammys, including a Lifetime Achievement Award in 1994. She scored 17 top-10 pop singles and 20 #1 R&B hits. She’s sold more than 75 million records worldwide.